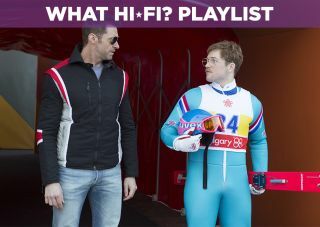 Eddie the Eagle - Blu-ray review | What Hi-Fi? Eddie the Eagle soars onto Blu-ray in this charming biopic of British Olympian Eddie Edwards. "It's not the winning but the taking part that counts," as the saying goes, and British comedy Eddie the Eagle embodies that spirit. Directed by Dexter Fletcher (Sunshine on Leith), it's based on the true story of Eddie Edwards, a willing but only moderately gifted athlete who – against all odds – managed to compete in the ski jumping event at the 1988 Winter Olympics. Starring Taron Egerton (Kingsman: The Secret Service) as the titular Eddie, he's joined by Hugh Jackman's fictional Bronson Peary, who plays a ski-jumper whose promising career was brought to a premature end. Eagle is not all that different to other feel-good films of its ilk, but to its credit, it nails the genre to a tee. You won't find many surprises here but Fletcher wraps you up in an engaging story with a central character who's plucky, tenacious and hard to dislike. Egerton is a charming presence and gets the chance to show off his comedic chops both verbally and physically in the role. Eddie's ignorance of the challenge he faces is matched by his determination and happy-go-lucky attitude, and the film shows affection for Eddie and his 'achievements', even when other characters are dismissive. Jackman's gruff character has your typical story arc: a tortured backstory, a reluctance to return to the sport before he eventually makes a comeback. It's a character we've seen many times but Jackman's natural charisma makes him likeable even when he's being a jackass. Eddie puts in a respectful performance on the AV side. There's nothing that immediately jumps out apart from some awful 80s fashion and Eddie's dreadful 'tache. Skin tones are relatively spot on, athough some scenes shot indoors have a golden orange glow that gives the impression that the actors have a sun tan. CG effects are the film's weakest points picture-wise, with some jarringly apparent. Eagle soars with a Dolby TrueHD 7.1 mix and a Dolby Atmos soundtrack. We only managed to check out the former and it's an engaging effort, complete with clearly presented dialogue. Matthew Margeson's score is strong, with plenty of 80s-style synths proving reminiscent of an '80s Hans Zimmer score or Vangelis' classic Chariots of Fire soundtrack. It has an enjoyably retro feel that, along with era-specific songs, successfully place the film in a place and time. Eddie the Eagle is a familiar underdog story but Dexter Fletcher tells it in such a cheerful, uncynical way that you can't help but root for its tenacious hero. It won't surprise many, even those who aren't familiar with the story, but if you like this type of film then you'll enjoy Eddie the Eagle.